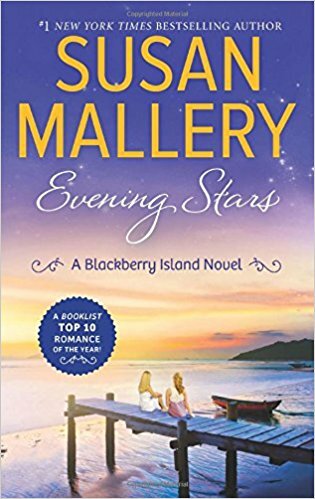 Evening Stars is a 2014 novel by Susan Mallery, from Mira books (a Harlequin imprint that features longer and more complex stories than genre romance, aimed at a broader audience). As the cover states, this is ‘A Blackberry Island Novel’ which tells us there are other stories in this setting. The Booklist review excerpt blurbed on the back notes “Mallery pulls out all the stops,” but that’s not always a good thing. Nina is the practical, sensible, caretaker in her family, looking after both her mother and her sister, and sacrificing her ambitions in the process. She’s thirty, lives with her mother, and is starting to feel frustrated with small town life and financial struggle (although she has been away to college, and helps run a family antique business as well as working as a nurse). The story begins with two (2) meet cutes, as different men from her past return to her town. Dylan, a couple of years older, was her first lover, and they were together for years, but he broke up with her, under pressure from his parents. Now a doctor, he’s returned to practice with his father. Kyle, several years younger, desired her when she babysat his younger sister. He’s now a military pilot, stationed nearby for a few months, and keen to fulfill some long-held desires. It’s been ten years since she’s had any contact with either of these men. Ten years! In which neither of the men married, and she married only briefly – just long enough to be married when Dylan made a rare trip home. Now Dylan apparently just wants to be friends, and Kyle just wants a fling. So this is a second chance story, but without much to sustain the desire, or much explanation as to why it endured. Nina’s up for a fling, and good for her, but it gets awkward when Kyle wants something more serious, and she rediscovers how good it was to be friends with Dylan. The romantic triangle never feels quite right, or quite wrong. Meanwhile, Nina’s wacky mother is upending the family with a plot twist that sends the narrative off in slightly disturbing directions. Nina’s sister interrupts the story with her struggling marriage subplot (including too much self-referential material about being a writer), and there’s another subplot involving the woman Nina hires to run the family’s antique store. Someone’s having an affair, too, but I don’t think it was anyone important. There’s a lot going on here, and too much of it is happening to characters I don’t care about. A big revelation is Nina’s bird’s-eye view of the island, which pushes her to get on with her life, and expand her horizons. However, it’s not as if she has never left the island, since she did spend two years in Seattle at college. Her experience with life in the big city weakens that revelation. The story expands from Nina’s second chance at romance to her second chance at making the life she wants. This is good, as sometimes you need time to be ready to seize opportunities, but at the end of the story I’m left wondering why it took so long for Nina to be ready for life and love – and what might have happened if Mr. Right, Mr. Right Now, and Mr. Deus Ex Machina had not shown up to rescue her.